The antics of Benjamin Netanyahu, Führer of Israel, would be hilarious if they weren't so often deadly. When he isn't lying about his extremely posh lifestyle, he's exhorting Jews to move to Israel every time a bad thing happens to (or near) Jewish persons anywhere in the world. This is all while practically begging the Islamic world to attack his purportedly save-haven country, by expanding Israel's borders into previously-agreed-upon Palestinian territory every chance he gets. The safest place for Jewish persons is probably anywhere but Israel as long as this keeps up. The astrologer may be temped to inquire: WTF is up with this guy? Libertarian: Pallas conjunct Mercury -- surprisingly, a very strong vector. Authoritarian: Pallas/Mercury conjunct South Node, ruled by Venus which is trine Pluto. One strong libertarian factor, overruled by two strong authoritarian factors. This kind of configuration often does more damage than a purely authoritarian chart: persons with wholly authoritarian charts often sink their own ship before piloting it to the heights of power. Capitalist: Venus trine North Node; Jupiter (ruling Venus and Second House) square the Nodes. Collectivist: Neptune sextile Venus and square Jupiter. A mixed signature, which most likely puts our chart on the economic Right. A mixed signature, which on the cultural spectrum tends to move a chart Left. Authoritarian + Capitalist(ish) + Liberal(ish) --> "Right-wing" Authoritarian. "Left-wing" charts with few exceptions usually contain zero "Right-wing" factors. In the astro-political classification system I use, the "Right" is a loose conglomeration somewhat resembling Ronald Reagan's "three-legged stool" model. 1. Pallas conjunct South Node, ruled by Venus which is trine Pluto. 2. Neptune sextile Venus and square Jupiter (ruler of Venus and Second House). 4. Moon sextile Pluto and ruled by Venus which is trine Pluto. 5. Sun quintile Pluto and ruled by Venus which is trine Pluto. 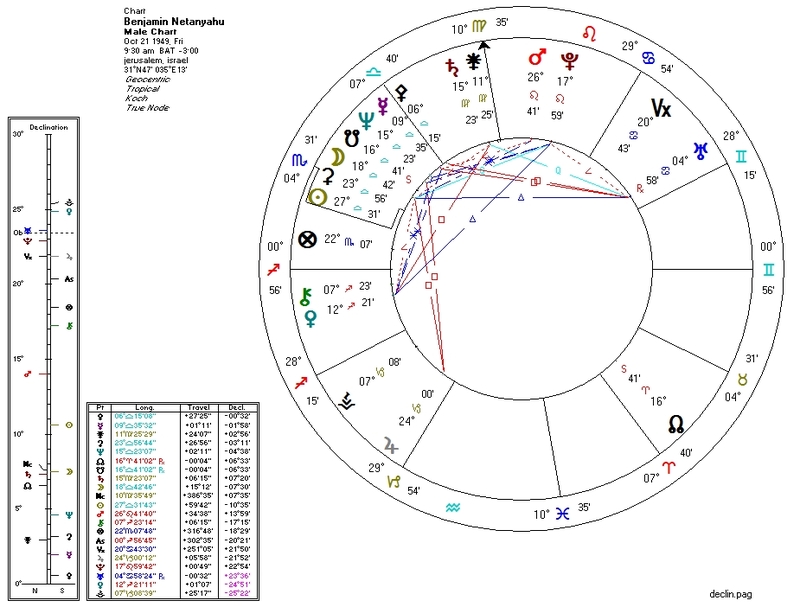 Mercury conjunct Neptune and South Node: combine this with the compromised Pallas, and we get a fellow who is infinitely more likely to lie than tell the truth. Neptune conjunct South Node, semisextile Saturn, and ruled by Venus which is square Saturn: Neptune-SNode-Saturn configurations tend to show up in the charts of atheists. In a recent visit I took to Budapest, Hungary, my local guide pointed out a new construction development: a city-within-the-city peopled by recent Jewish refugees from Israel. Evidence, no doubt, of that much-ballyhooed Jewish intelligence. Good for them. Better, though, if they kick out the leadership in Israel and replace it with those of sounder mind.